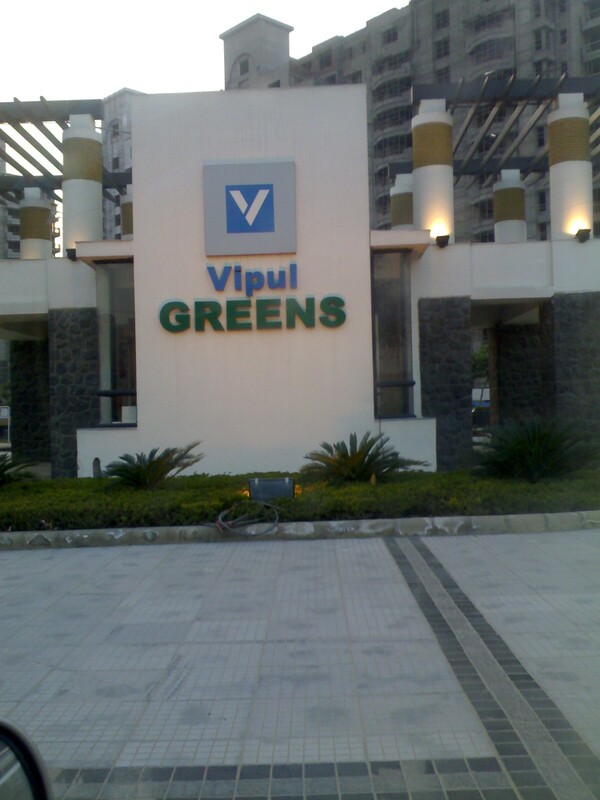 Last weekend I shifted my residence to a new apartment complex, Vipul Greens in Gurgaon (Sohna Road). The complex is pretty new with very few families in the complex yet – In fact, the tower that I’m in has just another family besides ours at the moment. However, the number is going up gradually and I see a lot of apartments getting ready for their occupants. The whole shifting process was very painful. More-over, the confusion created because of it got aggravated after one family member after another started falling ill – courtesy the chilly weather in Delhi since last 10 odd days. However things are getting back to normal and I hope by this weekend, we’ll have the house in order. b) Satellite TV not possible – I got Tata Sky people to install the TV unit only to learn that it is not possible to do so. They tell me that they don’t have a straight Line of sight (I guess pointing to their satellite) from my apartment and hence wouldn’t be possible to get it working right. I guess will have to continue with local Cable walla for the time being. Overall its been a good experience so far. Next Delhi BarCamp has been announced. It would be on 3rd May 2008. Venue is yet to be decided. Find more details about the same here. Yesterday I got paid for the first job completed as a freelancer. I spent two weeks working on this project and built a Java application to simulate load for a .NET based web portal – Will provide details on the project shortly in a separate post. Overall my first completed job experience has been pleasurable. I enjoyed working for this start up – interacting with their team allowed me exposure to a different style of work & am hoping to gather some knowledge of a new vertical in the near time to come. Spent last Saturday in 5th MOMO Delhi Meet held at Perot Systems Noida. MOMO is an acronym for Mobile Monday started as a casual meet of mobile enthusiasts. Read more about Delhi Chapter of the same here. This post talks about my first experience with MOMO meet. Read on ….. The venue was awesome with free snacks through out the day (courtesy Perot Systems). Despite the chilly weather, around 50 people turned up. The group consisted mostly of mobile enthusiasts, though a few entrepreneurs also managed to take out time from their schedule to attend as well – overall a good mix of audience. Unlike the Bar Camp last month, the talks were not Developer oriented but I personally got introduced to some interesting facts & products. Lokesh – CEO of mobisoc presented his product; Mitr which is a product suit that allows adding interesting services on a mobile phone. The demo of the product involved searching and adding services like those of PVR Cinemas, ICICI Bank, Yatra.com etc. The UI looked good and was pretty fast on the N95 that Lokesh was carrying. Chirag Jain, VP of webaroo gave a presentation on his product smsgupshup – A Free Group SMS solution. The slides besides introducing the product itself went a step ahead and explained the strategy/focus of his organization “To get the customer” first – Money in his opinion would follow. Personally I agree with Chirag and hope that his product would prove him right. I checked out smsgupshup and found it to be a pretty useful service. Hope to spend more time on it and become a publisher there. The other talk that I found interesting was that from Shekhar C (Tensor Technologies) on Meghdoot – which is a tool that allows sending SMS in Indian Languages. I found the demo very interesting – Shekhar demonstrated that even complex words when typed using English alphabets got converted perfectly into Hindi. I wish tools like those would start coming with default configuration on mobile phones. Besides the above Tarun Matta presented his company’s flagship product – RockeTalk; A social networking tool for a mobile phone. Kunal (http://www.bdaconnect.com) provided some interesting statistics & his opinion of the near future for the mobile market. Overall a good experience & thumbs up to the organizers for the meet. Had my first experience of Bar Camp at Noida last Saturday (8th of December). Around 100+ people turned up for the show. It was a great mix of Entrepreneurs, Bloggers & Techies. There were a couple of people from the media as well. Read on for more details about the event ….. The venue (Impetus Tech) was great with very comfortable atmosphere for discussions & presentations. The venue was split into three separate rooms, where sessions & demonstrations were held in parallel. The cafeteria was dedicated to content/blog related sessions, the main hall was where all the techie sessions were held & the lounge was used for demonstrations. The organizers were very actively monitoring the time slots for a session & ensured that sessions were progressing as planned earlier that day. a) Planning Poker by Vineet Tyagi (Impetus) – Vineet Introduced us with a nice way to estimate software completion dates. It was based on Agile Methodology and involves around giving a rating to a task and then re-adjusting the dates (if required) after the first task is completed. The technique demonstrated looked very easy & logical. I am hoping to practice it in the next assignment that I work on. b) Amazon Cloud computing (Jinesh Varia) – This session was liked by all who attended it. It introduced Amazon’s Ec2 & S3 services which provide storage & computing resources on the web. After the session, I have added a TODO item for my self to check them out in more detail. c) Ruby Insights (Sur at Vinsol) – This was an introduction to Ruby. I was and am planning to experiment with Ruby and Sur provided a good introduction to the same. I’m sure that many others in the crowd would have also enjoyed this session. Besides the tech sessions there was also a good discussion with Avinash (routeguru) where in he shared his thoughts & vision for routeguru & other similar applications in India. GIS Applications were discussed in detail in this session. Overall it was great fun to be there & I congratulate the organizers for making this a success. I have a new address at http://guneetsahai.com. The website currently is a set of static HTML pages that look decent and provide information about the kind of work that I have been doing so far. Have taken up a hosting package in a data center somewhere in Canda that provides me an independent Tomcat Server instance for something like $15 per month.